For healthy joints, cartilage and connective tissues. With Vitamin C, Rosehip, Ginger & Turmeric. Glucosamine Sulphate and Chondroitin are naturally occurring bio-chemical constituents found in the body and help to maintain the elasticity and fluidity needed for good joint mobility by stimulating the uptake of water and nutrients into the cartilage. Good joint mobility depends on healthy collagen and, consequently, healthy cartilage. Collagen is the main component of ligaments, tendons, cartilage and spinal discs. It is the most abundant protein found in mammals with its purpose being to actually connect cells together; the name collagen is derived from Greek and means to produce glue! Joints - has helped a number of joint related problems including joint mobility and helps reduce degeneration, swelling, inflammation, sciatica, recuperation from operations or injuries, osteoarthritis and slipped discs. Eyes - has helped in the condition uveitis which is an inflammatory disease of the iris and focusing muscle. It is also useful in preventing changes in the vitreous humour (substance within the eye) and thus protecting the retina from release. 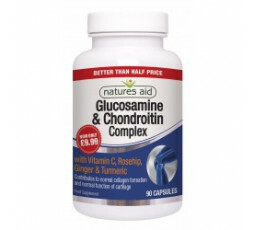 Glucosamine is an essential precursor of the GAG hyaluronic acid which is found in synovial fluids (lubricant in joints and tendon sheaths), vitreous humour and loose connective tissue. Chondroitin sulphates are a component of cartilage which help to attract water maintaining the compressibility/elasticity and fluidity of joint movement. Chondroitin sulphates are also components of the walls of blood vessels and are thus important in maintaining vascular health. Vitamin C plays a primary role in the formation of collagen which is important for the growth and repair of body tissue cells. 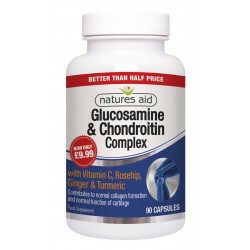 Glucosamine is a readily absorbed amino sugar which quickly enters the bloodstream and we would therefore recommend that anyone who has to monitor blood sugar levels are made aware of this fact. This product is also sodium free. The Chondroitin Sulphate in this product is sourced from shark cartilage and is bovine free.